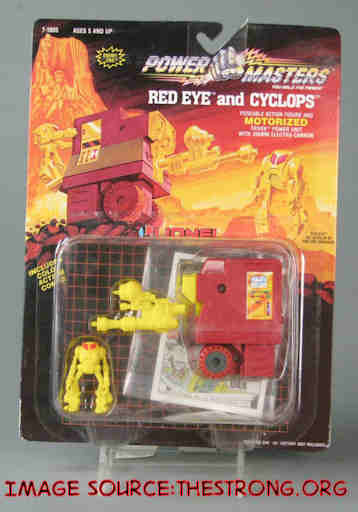 When you think of Powermasters, your probably think of this. The third of the “Masters” Transformers, the Powermasters were toys that couldn’t transform without their little engine guy to connect to them. Now I could go on about the flaw in that toy design, it’s possibly being a precursor to the “Armada” figures, or question how a person can power a Cybertronian robot, but none of that matters because we aren’t talking about them. The logo for Power Masters, a toy line that shouldn’t be confused with the Transformers Powermasters. The Power Masters (two words) were created for Lionel, a company known more for their model trains, highly sought after by enthusiasts. The concept was created by Victor G. Reiling and would have originally been titled Motor Masters. Which would still bring up Transformers when I went to find anything on it, but the odds would be more in my favor. The caption’s not wrong. Trying to bring up information on the toyline and TV show met with a lot of Transformers sites, and for some reason a lot of Masters of the Universe sites. And apparently I’m not the only one trying to find information about this. Lucky for me, some research and a bit of help from a fellow reviewer allows me to tell you what little I remember. Now I could try to go over what little I know, but this intro can tell you everything. Yes, it’s one of those intros but it’s a good thing. As a joke I mentioned on Twitter that even The Obscure, a video reviewer who’s subject should be obvious by his character and show name, couldn’t find the episodes. Apparently he took that as a challenge and even then all he found was the intro. So that’s the basic idea. I only caught part of the first episode, either due to tape damage, screwing up the recording time, space running out, or the possible irony of a power outage. It’s been so long since this came out, around 1987, that I can’t remember the reason. When I saw this in the TV Guide (back when TV Guide mattered) I thought it was a new Transformers cartoon at last. (Remember, this is 1987 and I didn’t know about Masterforce. All I knew about Japan back then was they existed, we used to fight them, they stopped being evil, and gave the universe Godzilla. I didn’t even know some of my favorite shows were mash-ups of Japanese shows.) I was destined to be disappointed. So how were the toys? I couldn’t find images of the larger boxed toys out of their boxes but these don’t really impress. Even in the show the “Erg” robots looked like something I would get out of a vending machine at Caldor. (Anybody remember that store? Or Bradlees? Consumers? Man, I’m getting old.) The vehicles, as you saw in the intro, were also lame. The “Fushionoids”, created by the kid in the cowboy hat if I recall correctly, could talk and stuff, but look where they’re sitting. There’s a seat at the back, kind of like riding the bumper and waiting for top-heavy physics to come in and crush them to death. Not a very good design. The TV series never occurred and I’m pretty sure the toyline flopped big time. I never saw enough of the show to really judge it and I don’t remember the toys in stores but from the images I can see why they didn’t go over, even beyond confusing old Transformers fans. They don’t look very good in a world where MASK and G.I. Joe existed. Still, I would love to find these episodes, perhaps doing a BW Video Review on them, if only for the tenuous Transformers connection. UPDATE–4/14/2019: Professor Doc recently uploaded most of the miniseries, or at least what was in decent shape in his collection, which I’ve posted as part of Saturday Night Showcase. Check it out here. Posted by ShadowWing Tronix on May 28, 2013 in Animation Spotlight, Television Spotlight and tagged Erg, Fushionoid, Power Master. I’m the one who posted the opening, and yes I have the complete mini series. A few years ago I planned to post them but YouTube has been a pain in the neck with copyright material! Even when I give credit! So I gave up on posting other videos. Hey, Professor Doc – I was just looking to see if the mini series was still around – and found this site and your post. Yeah – the toys were kind of lame, though the Lionel execs were really fun to work with and we were all excited at what we were coming up with for the TV show. I had previously worked as a writer on a lot of the original Transformer shows – as well as working as an associate producer (and, later, story-editor and writer) on G.I. Joe, and (many) others – but I was also the story-editor for TMS (the animation studio working with Lionel) on the Power Masters TV series – and, honestly, it was going to be pretty good. TMS was a good studio, we had an excellent producer (and, as I said, the Lionel execs were great to work with and gave us a lot of creative latitude), and the scripts were fun. I guess when the toyline tanked, more or less (hey – I loved my Lionel train set when I was little, but maybe they weren’t quite up to speed with giant robots?) — the powers that be pulled the plug on the tv series. But, yes, I did gather that TMS ended up producing the three part mini-series, which I wrote — but never got to see! So – if you are ever able to post the series to You Tube or let me know where I can find the DVD’s – I would love to add them to my collection – and, maybe sometime when I’m feeling brave, take a deep breath and watch the show! I never got to see the show because there was a glitch when I recorded it, thinking of course it was a new Transformers show because I hadn’t heard of the Lionel toys, I liked the premise at least. It was just the vehicles were lame. But I remember only two episodes listed in TV Guide. 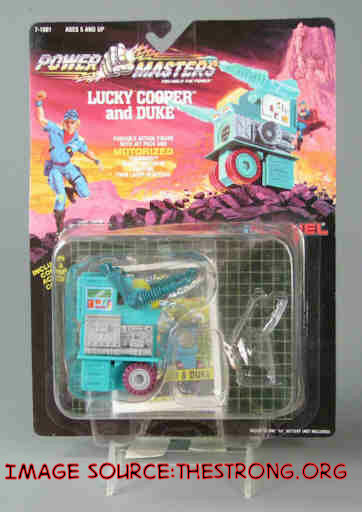 I didn’t know there was a third, but finding information on this show is almost impossible because they used a name tied to a more famous toyline. Someone else had to find Professor Doc’s intro for me and I still don’t know how they did it.